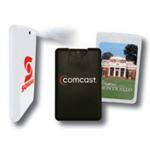 Custom Credit Card Mints with a full color imprint on a clear or white label. 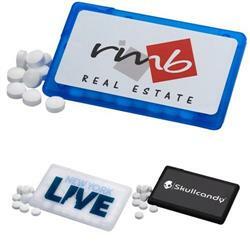 This business card style mint dispenser comes filled with with Sugar Free Peppermints. Meets FDA guidelines. Gluten free. RUSH AVAILABLE! Typical Imprint Area(s): 2 5/8" x 1 3/8"
Available Imprint Options: Full Color Process Label. Credit Card Mints, Peppermint, FDA approved, Gluten Free.